Includes: bra, belt, skirt, armbands with laces, necklace, half-circle chiffon veil. Fabric: white abstract animal print silk-like fabric. Beading: white, multi, pearls, AB stones. Belt: one piece belt attached to the skirt. 37" from end to end. 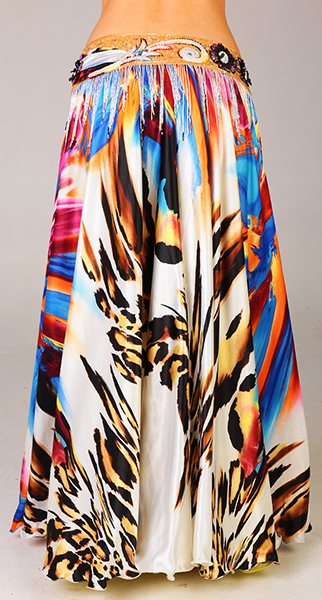 Skirt: full double layer skirt (bottom layer yeallow chiffon) with two slits in front. Length: 39"